I bought this Maybelline Age Rewind Foundation a couple months back and I have to admit that I bought it completely by accident. I know that it sounds silly that I actually went into a store and bought the wrong thing, but I genuinely just picked up the wrong item. 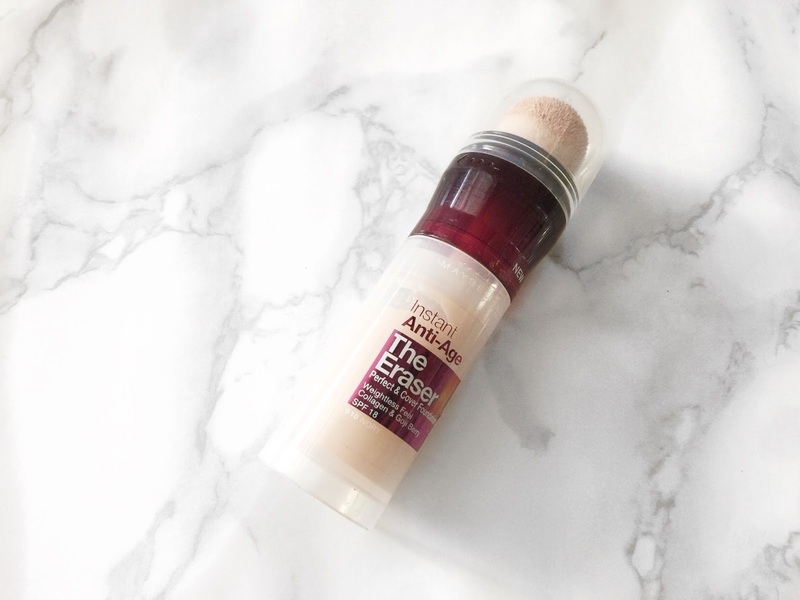 I wanted to get the Maybelline Age Rewind concealer, but I was away with the fairies and ended up buying the much larger foundation, how I managed it, I have no idea. I even tried to return this before I opened it up as soon as I realised my mistake, but because of the applicator, they couldn’t accept it, so I decided that I may as well try it out for myself. I will make it quite clear at this point in the review, that when I started to use this product, I was bloody disappointed with it. I hate to do a post that is full of negativity, but just remember that just because something doesn’t work for me and it isn’t what I personally wanted, it doesn’t mean that it won’t work out for somebody else. I just want to share my experience with this foundation in case somebody out there is thinking of trying this out for themselves, so they have the full picture with the good, the bad and the ugly. First up, I will talk about the packaging. The packaging of this product is identical to that of the corresponding concealer, just on a larger scale. That is why I managed to mix them up when I went into store to pick it up. I was just looking for a product with a twist up applicator and a sponge top and that is what this foundation has. The packaging and applicator of this doesn’t bother me, but it also isn’t my favourite. I would much rather have a traditional style pump on my foundation rather than a sponge because this can just spread germs around the face and make breakouts spread. The first time I went to use this, I will say that I had to twist it so many times just to get any product up through the sponge. Then when I went to apply it to the face, I felt like next to no product was applied. The only way that I could seem to get a decent amount on my face was to make sure that the sponge was incredibly saturated with product so that it would stop absorbing what I was trying to apply. Once, I applied some of this to the face by just dabbing small amounts in different areas, I would take a buffing brush, either the Morphe M439 or Sigma F80 and buff it out in the skin, the same as I would with any other foundation. I would say that straight off the bat, this is a sheer to medium finish foundation. I am normally a full coverage kind of girl, so this product really doesn’t work for me. I found that this didn’t hide any of my problem areas or my darkness. It did help to slightly even my skin tone, but that is about as far as this foundation went for me. I know that some people do like a sheer finish, so this could be perfect for somebody else, but when I am wearing makeup, I like it to hide my imperfections, if not I don’t see the point in bothering! The other thing about this foundation which was such a red flag in my eyes was the fact that it felt so greasy on the skin. I honestly have never used a foundation like this before. As I applied it to the face and before I even started to blend it out, it felt like pure oil on my face. I have an oily complexion, but I do use products that are hydrating because I love a dewy look, but this was just on another planet. When I had this foundation all over my face and even after I set it with powder, I look like an oil slick. Then as the day went on and my natural oils started to come out, my skin looked simply horrific. Luckily for me, I keep makeup wipes in the car and I could take this off before anybody saw me! I feel really bad for doing a post like this that is completely negative, but I really wanted to share my honest review. I have given up on this Maybelline Age Rewind Foundation because it is incredibly greasy, the applicator isn’t great, and the coverage pretty much isn’t there. I will leave a link to this foundation down below because remember, just because something doesn’t work for me, doesn’t meant that it won't work for you. Make sure to leave me a comment and let me know if you have tried this foundation and tell me what you thought about it! The concealer is amazing isn't it?! I heard hreat things about the concealer, there was a time when everyone was using it and had great reviews. Too bad this one is not for oily skin, I avoid bases with oily texture. For somebody with a dry skin type, I bet this foundation would be a dream!